We specialize in building exceptional interior graphic spaces. With about 98 percent of signage indoors, we’ve invested in the technology and knowledge to make interior environments our core competency. Studies clearly indicate that functional and beautiful environments increase sales, improve company culture, and enhance the livability of all spaces. We specialize in building exceptional interior signage and custom wall graphic spaces –everything from wall, window, and floor graphics to custom traditional signage. 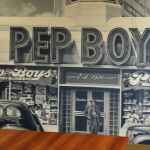 Our interior signage solutions can transform your space into one that creates lasting impressions. With the advent of custom printable film we can literally cover your walls, windows, ceilings, floors, or doors with any design or image you choose. We can create custom graphics on backlit displays, decals, murals, and banners that can be used to promote a new product or service or set the mood in office, retail, or residential spaces. We can create individual, smaller graphics to highlight your company logo, design, or even your company’s mission statement. Or we can cover an entire expanse of wall with beautiful graphics and color to enhance your environment. These graphics can be printed on a variety of materials, including fabric, for temporary, repositionable, or permanent installations. We can design and produce a solution that will leave a lasting impression. A graphic art design applied directly to the wall or face of a building or structure. No longer do you have to live with plain, drab walls in your office, retail store or living space. Let us create a custom graphic display to enhance your image and build lasting impressions with your customers. With the advent of custom printable film and wallpaper, we can literally cover your walls with any design or image you choose. We can create individual, smaller graphics to highlight your company logo, design, or even your company’s mission statement. 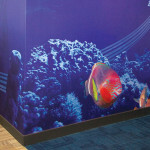 Or we can cover an entire expanse of wall with beautiful graphics and color to lighten your environment. Take advantage of the unused wall real estate in your space to increase sales and customer satisfaction. Studies clearly indicate that beautiful environments increase sales, improve employee morale and enhance the livability of all spaces. Now – you can create your own designs with the HP Wall Art app. Click below to design your own wall graphics. Then, submit your design to us for printing. We can help you finish the design. Then we’ll print it and deliver it directly to you. Interested in Wall Graphics? Contact Us. Eye-catching advertising, promotional, and directional floor graphics are becoming more and more prevalent in exhibition and retail venues, in airports, in restaurants, movie theaters, gas stations, and convenience stores across the country. Window, wall and floor graphics and decals are just the beginning. We also offer the following: Carpet graphics, Concrete graphics, Customized floor graphics, Directional floor graphics, Hardwood floor graphics, Perforated vinyl decals and graphics, Removable floor graphics, Smooth floor graphics and Slip-resistant floor graphics Interested in Floor Graphics? Contact Us. A printed film, usually made of vinyl, with a pressure sensitive adhesive. Interested in Decals? Contact Us. Our wallpaper print media includes a beautiful range of embossed textures, metallic and reflective media. 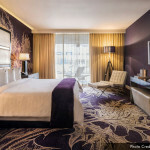 Custom wallpaper is an emerging trend among marketing experts and interior designers. We have partnered with HP so that we can design and print custom wallpaper using the images, patterns, and colors specified by our clients. You can click the Printology HP Wall Art app on our website to design your own wallpaper and then submit your design to us for printing. Our wallpaper print media includes a beautiful range of embossed textures, metallic and reflective media, and PVC-free, recycled products providing a complete range of decorative options for both residential and commercial clients. We offer interior signage for branding, retail, and way finding solutions. Our custom signage solutions will help you communicate messages, manage traffic, and promote your brand and retail space with lobby, dimensional and office signs, ADA signs, directional signs, safety and compliance signs, menu boards, and point-of-purchase signage. Any type of signage from dimensional letters to acrylic stand-off signs to backlit displays to electronic digital displays that greets visitors entering the lobby of a building. Interested in Lobby Signs? Contact Us. Signs with changeable copy typically used by retailers to list items, product descriptions, pictures, and prices of good currently offered, or by restaurants to describe daily menu items or specials. Interested in Menu Boards? Contact Us. Point of Purchase signs for in-store advertising designed to sell to more and different products to shoppers once they are in the store through the use of special displays and dispensers. Interested in Point of Purchase Signs? Contact Us. Signage listing names and locations for multiple business tenants in the building or companies in an industrial or office park. Interested in Directory Signs? Contact Us. Signs in compliance with the American with Disabilities Act requirements including raised and Braille characters, pictograms, finish and contrast specifications, mounting location and height guidelines, character proportion and character height specifications. Interested in ADA Signs? Contact Us. Signs that enable a person to find his or her way to a given destination. Interested in Wayfinding Signs? Contact Us.